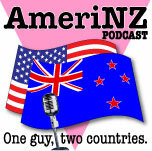 » AmeriNZ 117 – Back to work AmeriNZ Podcast: One guy, two countries. It’s back to work today, with our guests gone and the holiday over. So I start today by talking a bit about our week. After that, I update a couple things, and comments let me add some more. Now it’s back to normal podcasting (by the way, I DO know it’s October now, despite the date I said at the beginning; I was still in holiday mode when I recorded, I guess). Today’s link: The blog post I mentioned with the photo taken in front of Kelly Tarlton’s. 3 users commented in " AmeriNZ 117 – Back to work "
Ann: Thanks for the link! I’d heard about that article somewhere but just hadn’t had time to look it up. Nessa: If Robbie Burns reciting or haggis eating were part of it, you might fare differently… Seriously, we did have a great time with our nieces, and we’ll probably host them again sometime. Hope you’re having a great vacation!